Posted on January 15, 2018 at 9:21 am. It’s a new year, and Emu online casino is clearing out its old promos, giving away discounted deposit and cash bonuses. Up until January 31, registered players can visit Emu’s online casino shop to purchase bonuses with EmuPoints and save up to 45 percent. 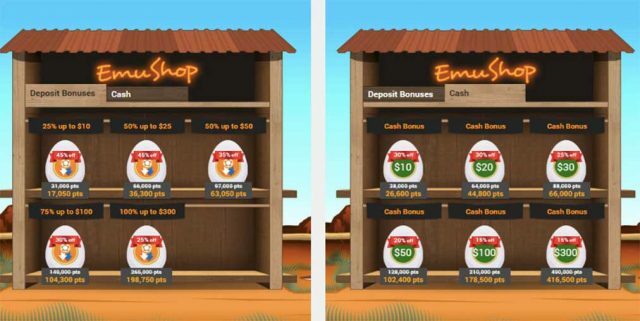 If you’re a bit confused about the lingo we are throwing around, the EmuShop is where you can purchase bonuses and prizes using points you have accumulated while playing real money casino games. From the moment you sign up to Emu, you will receive EmuPoints, with 1000 credited to your verified account upon registration. You can then earn 200 points per day just by logging in and playing the real money casino games. You will also receive EmuPoints for verifying your identity and making your first withdrawal. The easiest way to earn points is by playing the 800-plus casino games. While you can get up to 14 points for every $10 on the slots and scratchies, new players can only earn nine points until you climb the VIP levels. Players start at the Newbie level, and climb the Bronze, Silver, Gold, Platinum and Elite levels, scoring bigger bonuses and cash drops. New players can also receive one point for every $10 on progressives, video poker, blackjack, roulette, and other table games. Platinum and Elite players earn two points for every $10 bet on these games. For the time being, all players, irrespective of their VIP status, can claim 45 percent on deposit bonuses and 30 percent on cash bonuses using their EmuPoints in the EmuShop. For example, players can currently claim a 25 percent match deposit bonus up to $10 for 17,050 points, down from 31,000 points. To purchase the bonus, login after signing up and click on the EMUSHOP. Select the bonuses you want and then click on BUY WITH POINTS. The specials you have chosen will appear under BONUSES in your account. You will then be able to claim the deposit bonus the next time you fund your account, or you will receive the cash rewards once you have purchased the bonus. The sale means you can get more bonuses out of your points, which come with terms and conditions attached. We recommend reading all of the rules set out, accessible at the bottom of the online casino’s homepage. If you don’t have enough points to purchase anything in the shop yet, sign up, verify your identity, and start playing the range of real money casino games, and you’ll be on your way to discounted match deposits and cash bonuses. If you have any questions, be sure to utilise the casino’s support team with a chat box available in the bottom right-hand corner for a quick response.